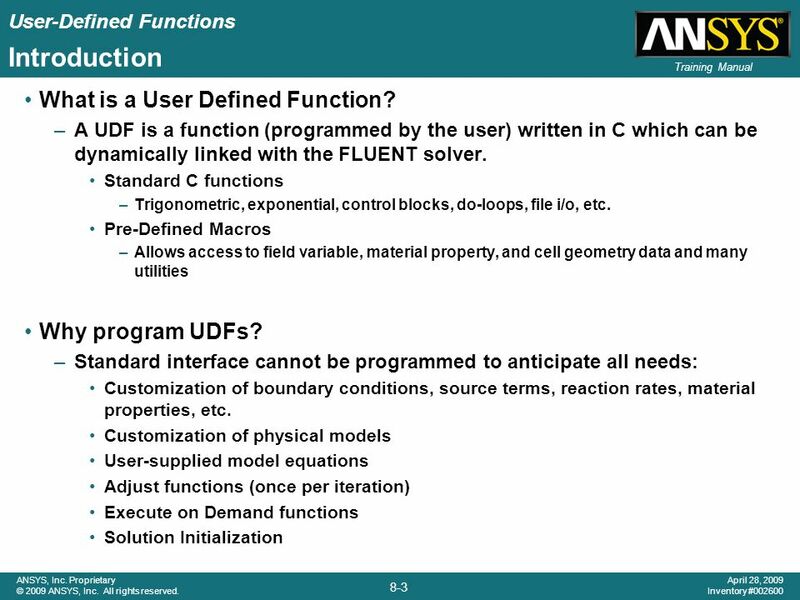 3 Introduction What is a User Defined Function? 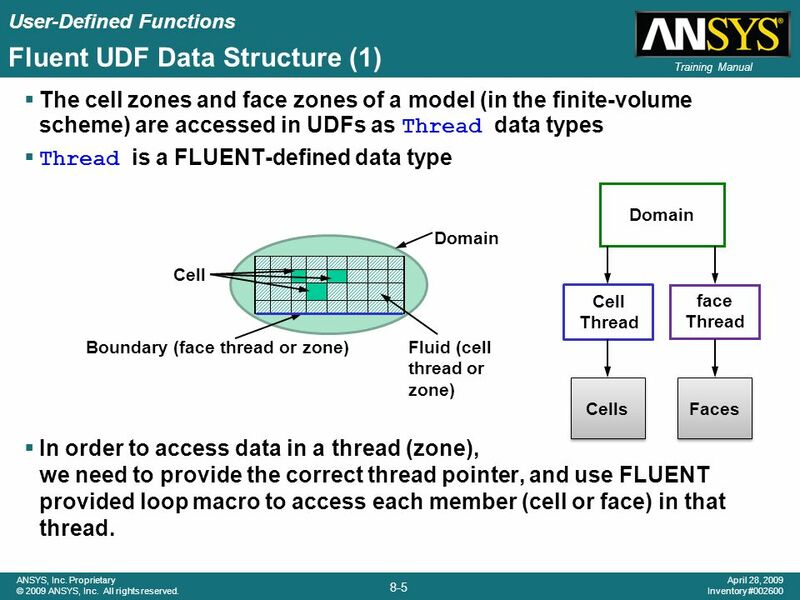 Why program UDFs? User-Defined Properties User-Defined BCs User Defined INITIALIZE Segregated PBCS Exit Loop Repeat Check Convergence Update Properties Solve Turbulence Equation(s) Solve Species Solve Energy Initialize Begin Loop DBCS Solve Other Transport Equations as required Solver? 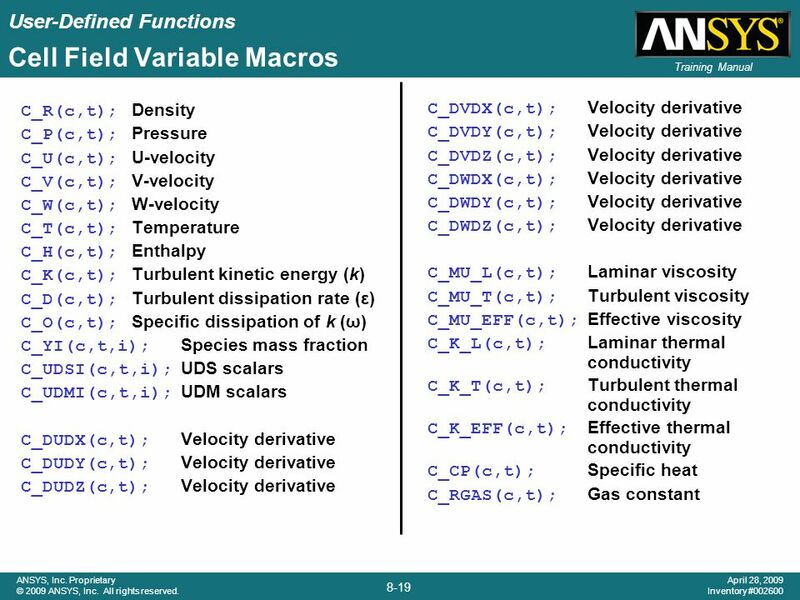 Solve Mass Continuity; Update Velocity Solve U-Momentum Solve V-Momentum Solve W-Momentum Solve Mass & Momentum Solve Mass, Momentum, Energy, Species User-defined ADJUST Source terms Source terms This slide takes a birds-eye-view of the FLUENT solvers. The solution procedure begins with initialization, following which an iteration loop is opened. For keeping things simple, we are considering only steady state analysis procedure here. Within the loop we solve the conservation equations for mass, momentum and energy either as coupled or in sequence based on the choice of the solver. Other scalar equations like turbulence, species and user-defined-scalars are solved sequentially after the basic flow equations. We then update boundary conditions, properties based on the recent solution Next the state of convergence is checked and a decision is made whether or not to continue through the iteration loop. Now, for users to customize the code, we needed to design ‘access-point’s for the user. Those are shown in blue boxes. These are: The user can initialize the fields his way; Can take control at the top of the iteration loop for making some special computation; Can add source terms to all equations; Can defined most properties with custom functions; Can prescribe special boundary conditions. 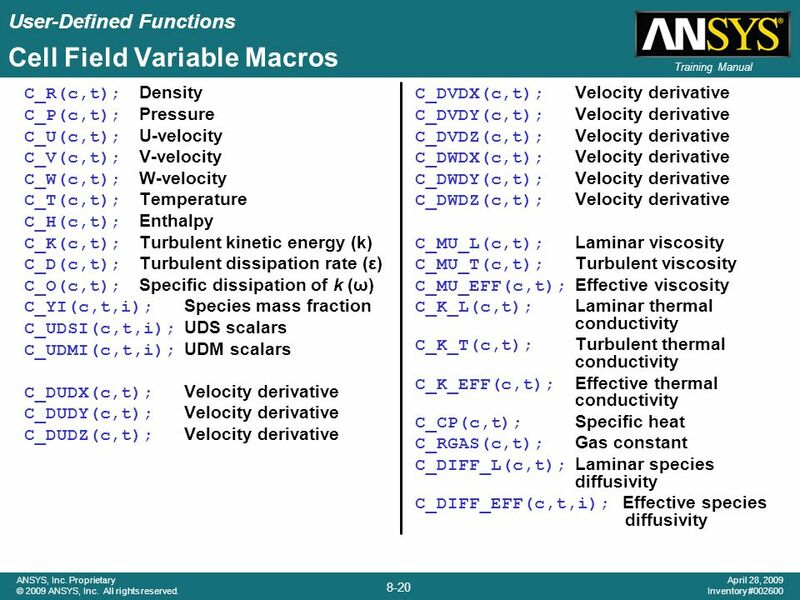 And what are not shown here are that the user can make model specific changes - for example, can modify convective flux function for scalars, various multiphase functions, modify turbulent viscosity or even time steps in unsteady analysis. We would like to impose a parabolic inlet velocity to the 2D elbow shown. 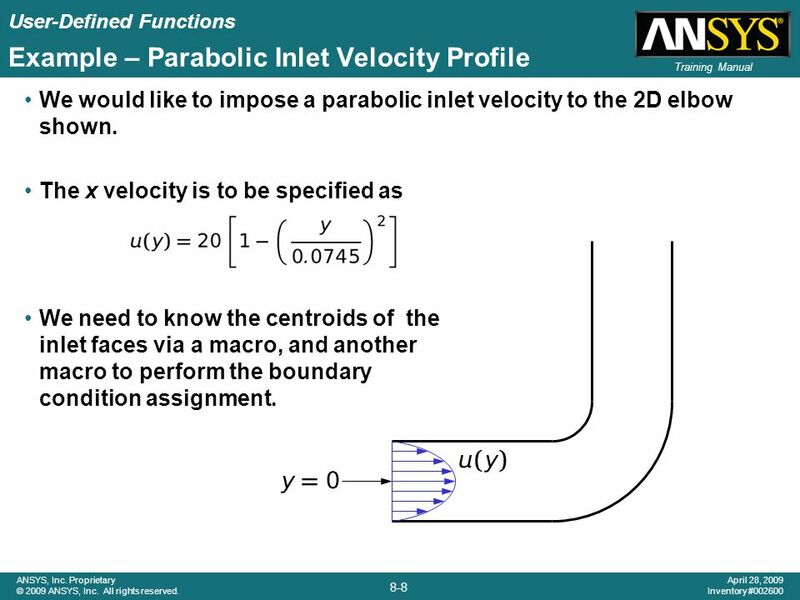 The x velocity is to be specified as We need to know the centroids of the inlet faces via a macro, and another macro to perform the boundary condition assignment. Functions can either be read and interpreted at run time or compiled and grouped into a shared library that is linked with the standard FLUENT executable. 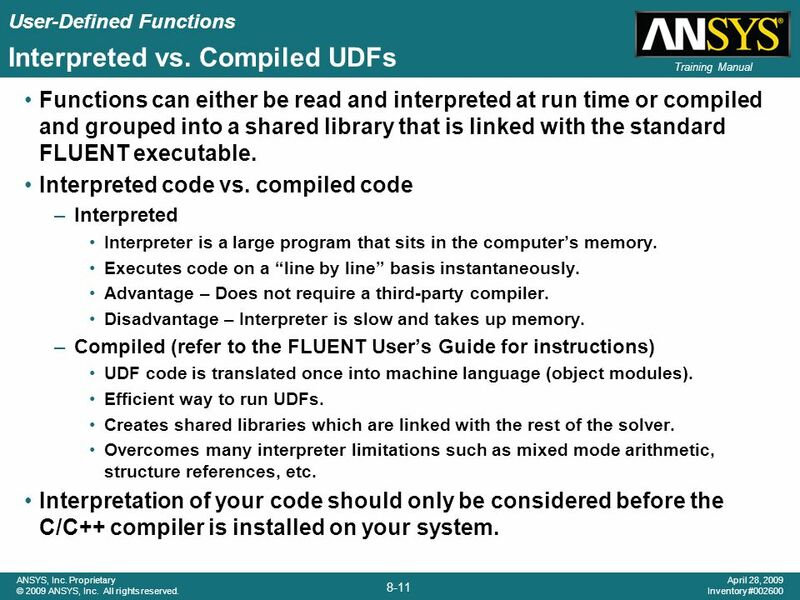 Interpreted code vs. compiled code Interpreted Interpreter is a large program that sits in the computer’s memory. Executes code on a “line by line” basis instantaneously. Advantage – Does not require a third-party compiler. Disadvantage – Interpreter is slow and takes up memory. 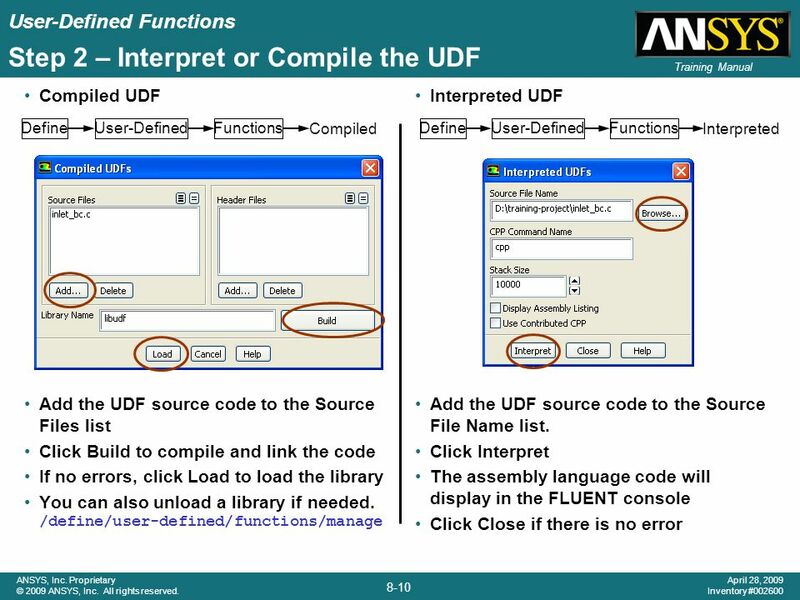 Compiled (refer to the FLUENT User’s Guide for instructions) UDF code is translated once into machine language (object modules). 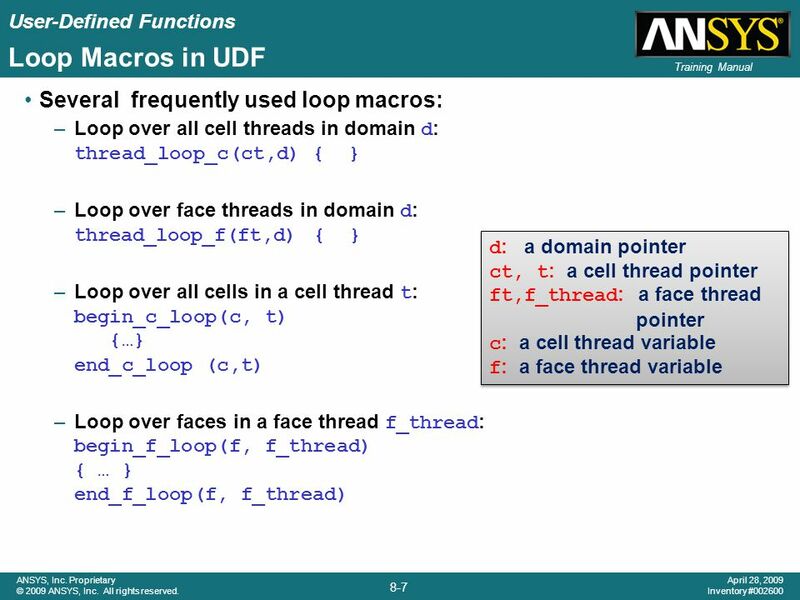 Efficient way to run UDFs. Creates shared libraries which are linked with the rest of the solver. Overcomes many interpreter limitations such as mixed mode arithmetic, structure references, etc. Interpretation of your code should only be considered before the C/C++ compiler is installed on your system. Explain for simple problems interpreted codes is the way to go. Does not require Makefiles. However, handles only a subset of the C language. 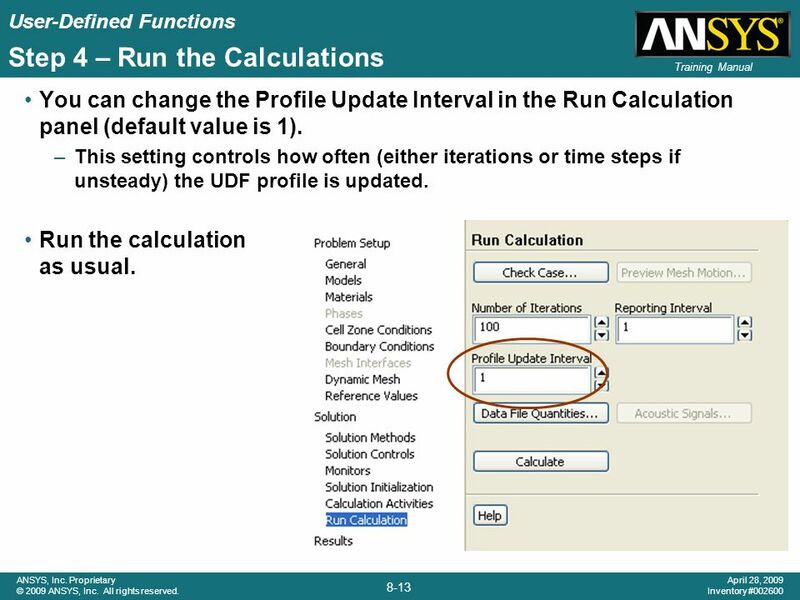 You can change the Profile Update Interval in the Run Calculation panel (default value is 1). 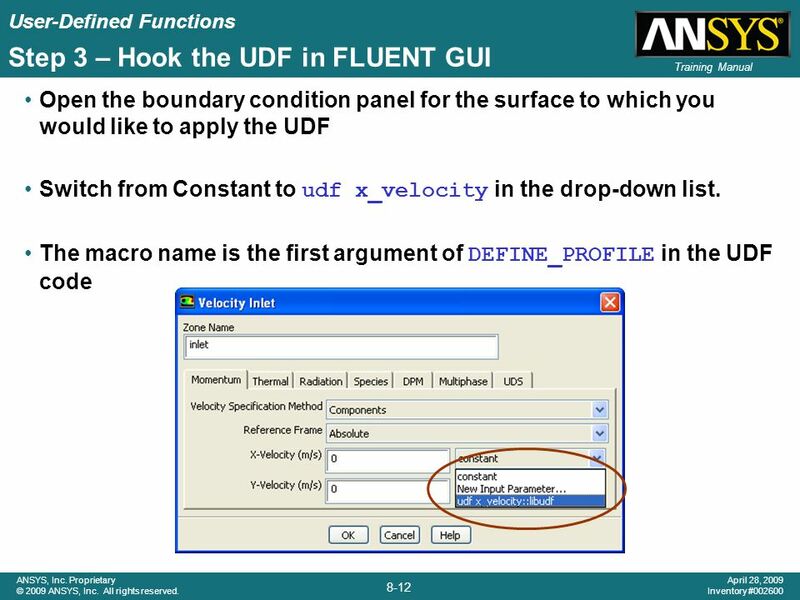 This setting controls how often (either iterations or time steps if unsteady) the UDF profile is updated. Run the calculation as usual. The figure on the left shows the velocity field through the 2D elbow. 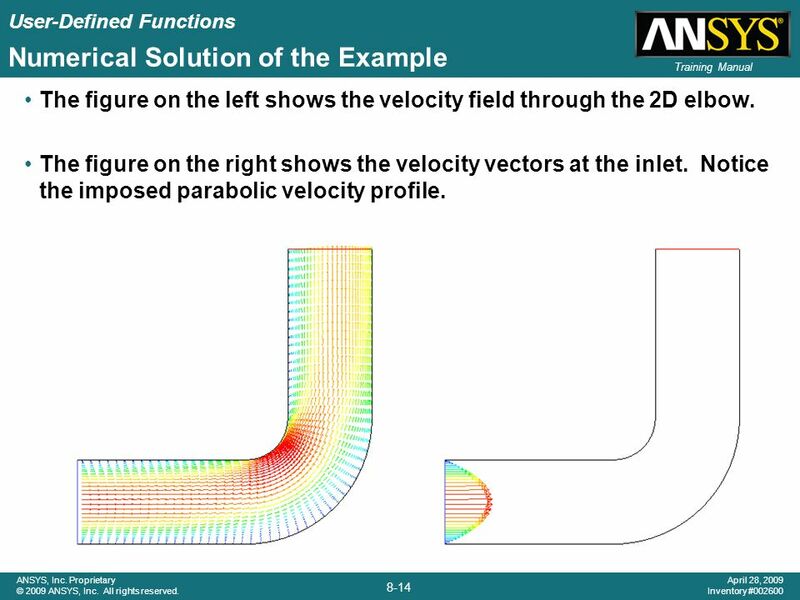 The figure on the right shows the velocity vectors at the inlet. Notice the imposed parabolic velocity profile. 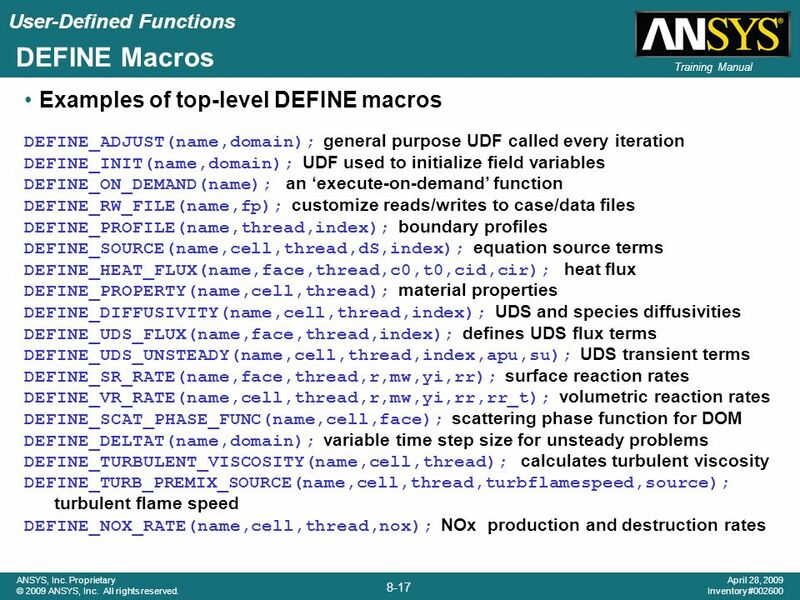 DEFINE_ADJUST(name,domain); general purpose UDF called every iteration DEFINE_INIT(name,domain); UDF used to initialize field variables DEFINE_ON_DEMAND(name); an ‘execute-on-demand’ function DEFINE_RW_FILE(name,fp); customize reads/writes to case/data files DEFINE_PROFILE(name,thread,index); boundary profiles DEFINE_SOURCE(name,cell,thread,dS,index); equation source terms DEFINE_HEAT_FLUX(name,face,thread,c0,t0,cid,cir); heat flux DEFINE_PROPERTY(name,cell,thread); material properties DEFINE_DIFFUSIVITY(name,cell,thread,index); UDS and species diffusivities DEFINE_UDS_FLUX(name,face,thread,index); defines UDS flux terms DEFINE_UDS_UNSTEADY(name,cell,thread,index,apu,su); UDS transient terms DEFINE_SR_RATE(name,face,thread,r,mw,yi,rr); surface reaction rates DEFINE_VR_RATE(name,cell,thread,r,mw,yi,rr,rr_t); volumetric reaction rates DEFINE_SCAT_PHASE_FUNC(name,cell,face); scattering phase function for DOM DEFINE_DELTAT(name,domain); variable time step size for unsteady problems DEFINE_TURBULENT_VISCOSITY(name,cell,thread); calculates turbulent viscosity DEFINE_TURB_PREMIX_SOURCE(name,cell,thread,turbflamespeed,source); turbulent flame speed DEFINE_NOX_RATE(name,cell,thread,nox); NOx production and destruction rates It is not necessary and you should not go into a detailed description on each of the above DEFINE macros. Pick a couple and describe what they are used for. 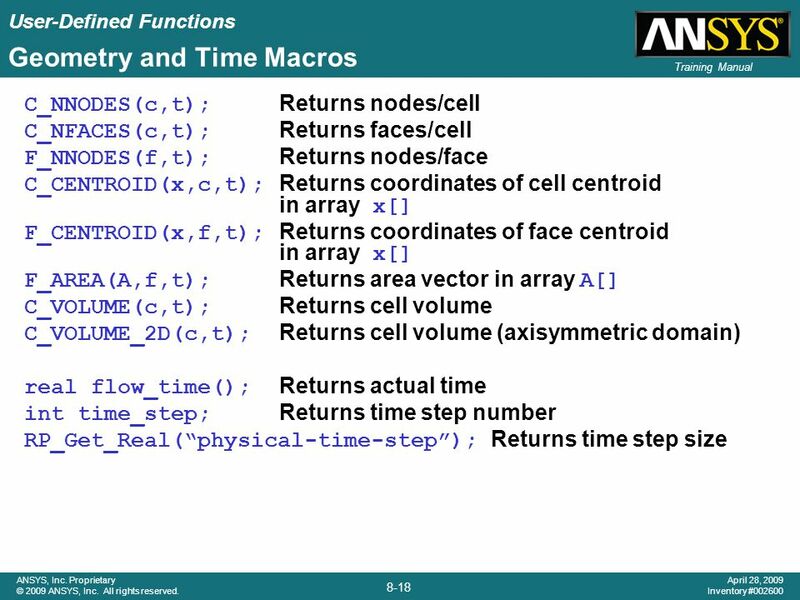 C_NNODES(c,t); Returns nodes/cell C_NFACES(c,t); Returns faces/cell F_NNODES(f,t);	Returns nodes/face C_CENTROID(x,c,t);	Returns coordinates of cell centroid in array x F_CENTROID(x,f,t); Returns coordinates of face centroid in array x F_AREA(A,f,t); Returns area vector in array A C_VOLUME(c,t); Returns cell volume C_VOLUME_2D(c,t); Returns cell volume (axisymmetric domain) real flow_time(); Returns actual time int time_step; Returns time step number RP_Get_Real(“physical-time-step”); Returns time step size Don’t discuss all in detail. C_R(c,t);	Density C_P(c,t);	Pressure C_U(c,t);	U-velocity C_V(c,t);	V-velocity C_W(c,t);	W-velocity C_T(c,t);	Temperature C_H(c,t);	Enthalpy C_K(c,t);	Turbulent kinetic energy (k) C_D(c,t);	Turbulent dissipation rate (ε) C_O(c,t);	Specific dissipation of k (ω) C_YI(c,t,i);	Species mass fraction C_UDSI(c,t,i); UDS scalars C_UDMI(c,t,i); UDM scalars C_DUDX(c,t);	Velocity derivative C_DUDY(c,t);	Velocity derivative C_DUDZ(c,t);	Velocity derivative C_DVDX(c,t); Velocity derivative C_DVDY(c,t); Velocity derivative C_DVDZ(c,t); Velocity derivative C_DWDX(c,t); Velocity derivative C_DWDY(c,t); Velocity derivative C_DWDZ(c,t); Velocity derivative C_MU_L(c,t); Laminar viscosity C_MU_T(c,t); Turbulent viscosity C_MU_EFF(c,t); Effective viscosity C_K_L(c,t); Laminar thermal conductivity C_K_T(c,t); Turbulent thermal conductivity C_K_EFF(c,t); Effective thermal conductivity C_CP(c,t); Specific heat C_RGAS(c,t); Gas constant Don’t discuss all in detail. C_R(c,t);	Density C_P(c,t);	Pressure C_U(c,t);	U-velocity C_V(c,t);	V-velocity C_W(c,t);	W-velocity C_T(c,t);	Temperature C_H(c,t);	Enthalpy C_K(c,t);	Turbulent kinetic energy (k) C_D(c,t);	Turbulent dissipation rate (ε) C_O(c,t);	Specific dissipation of k (ω) C_YI(c,t,i);	Species mass fraction C_UDSI(c,t,i); UDS scalars C_UDMI(c,t,i); UDM scalars C_DUDX(c,t);	Velocity derivative C_DUDY(c,t);	Velocity derivative C_DUDZ(c,t);	Velocity derivative C_DVDX(c,t); Velocity derivative C_DVDY(c,t); Velocity derivative C_DVDZ(c,t); Velocity derivative C_DWDX(c,t); Velocity derivative C_DWDY(c,t); Velocity derivative C_DWDZ(c,t); Velocity derivative C_MU_L(c,t); Laminar viscosity C_MU_T(c,t); Turbulent viscosity C_MU_EFF(c,t); Effective viscosity C_K_L(c,t); Laminar thermal conductivity C_K_T(c,t); Turbulent thermal conductivity C_K_EFF(c,t); Effective thermal conductivity C_CP(c,t); Specific heat C_RGAS(c,t); Gas constant C_DIFF_L(c,t); Laminar species diffusivity C_DIFF_EFF(c,t,i); Effective species diffusivity Don’t discuss all in detail. 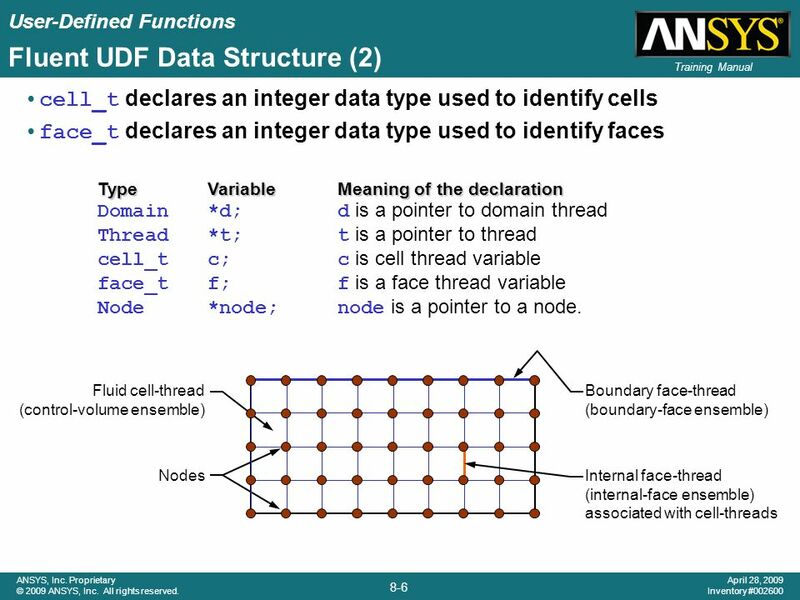 22 User Defined Scalars FLUENT can solve up to 50 generic transport equations for user-defined scalars Number of UDS variables In which zones the UDS is solved Flux Function DEFINE_UDS_FLUX(name,face,thread,index) Unsteady function DEFINE_UDS_UNSTEADY(name,cell,thread,index,apu,su) If statements are required in order to associate multiple flux and transient functions with each UDS Example Can be used to solve the electromagnetic field equations. 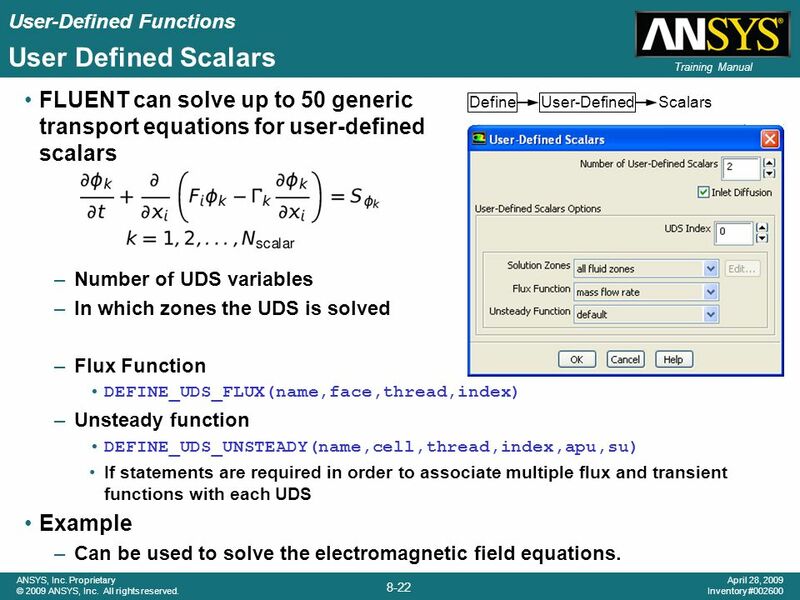 Define User-Defined Scalars The setup for UDS are summarized in these two slides. 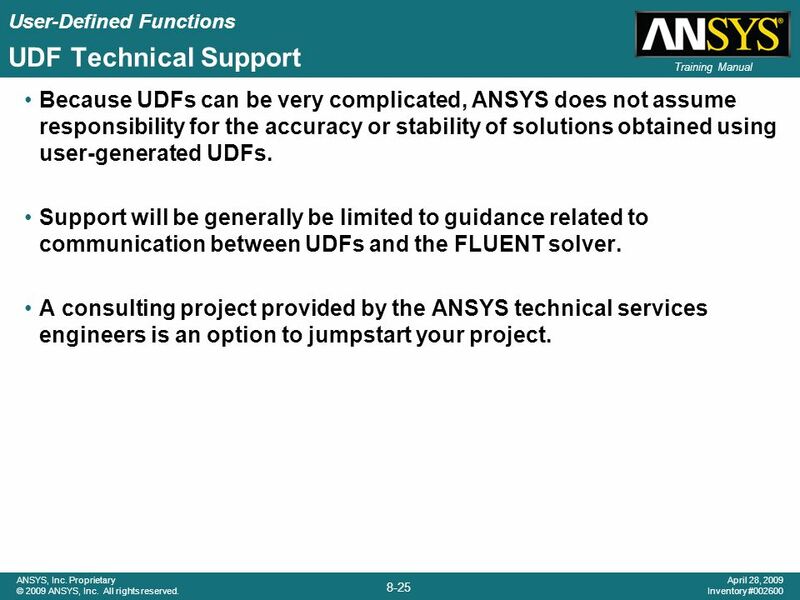 25 UDF Technical Support Because UDFs can be very complicated, ANSYS does not assume responsibility for the accuracy or stability of solutions obtained using user-generated UDFs. 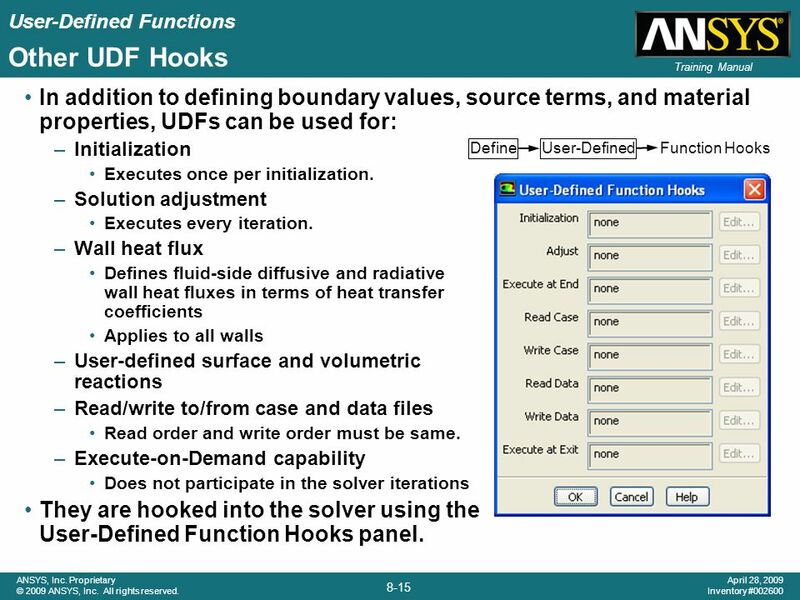 Support will be generally be limited to guidance related to communication between UDFs and the FLUENT solver. 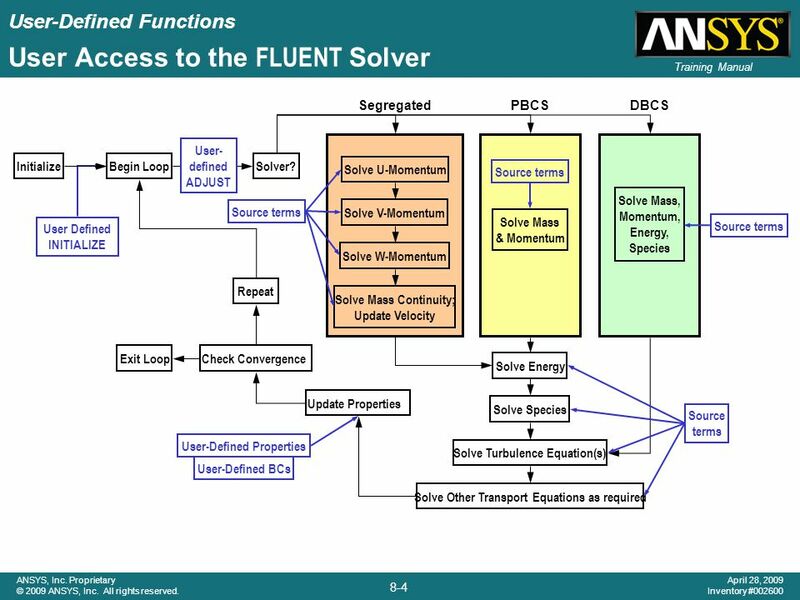 A consulting project provided by the ANSYS technical services engineers is an option to jumpstart your project. Explain for simple problems interpreted codes is the way to go. Does not require Makefiles. However, handles only a subset of the C language. 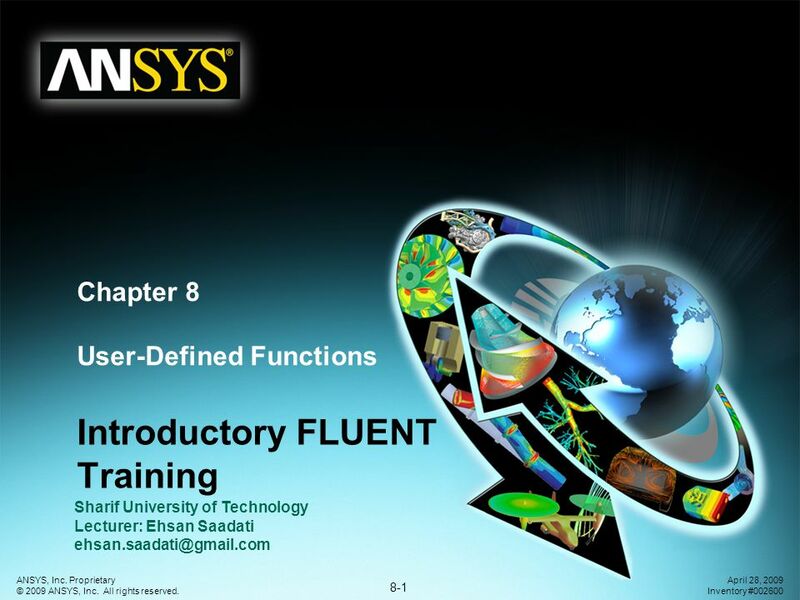 Download ppt "Chapter 8 User-Defined Functions"
© Copyright by Deitel & Associates, Inc. and Pearson Education Inc. All Rights Reserved. 1 Tutorial 12 – Security Panel Application Introducing. 1 Application of for Predicting Indoor Airflow and Thermal Comfort.  2000 Prentice Hall, Inc. All rights reserved. 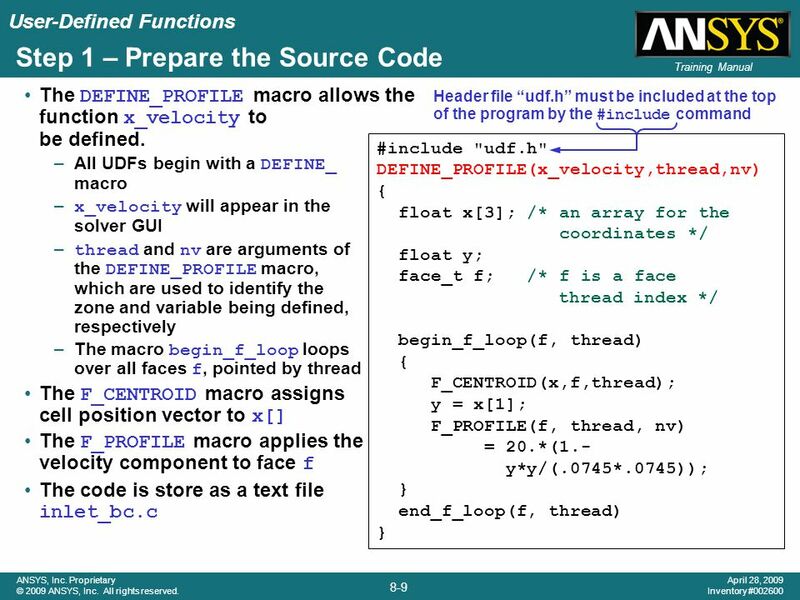 Chapter 14 - Advanced C Topics Outline 14.1Introduction 14.2Redirecting Input/Output on UNIX and DOS Systems.